You may be an expat returning from abroad, a member of the armed services previously stationed in Europe or immigrating to the UK. One thing you will have in common is a attachment to your car, all the associations with your travels, outings, friends and adventures on foreign soil. Of course, you could sell it, replace it with a UK model or use public transport but another just wouldn’t be the same. With some patience, form-filling and a certain financial outlay, you can register your car in the UK and this article explains how. If you become a resident in the UK, you must tax and register your vehicle in the UK straight away. There is a grace period of 6 months but you can be stopped by the police and asked for evidence of how long you’ve had the car in the UK. After that time you will no longer legally be able to park or drive on public roads. 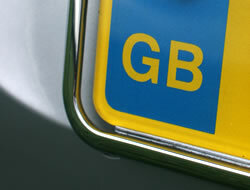 So, if you want to keep your car and use it regularly it’s worth getting it UK registered. There are a number of steps but it is possible to complete the process within a few weeks. The procedure is set out below with links to the necessary forms, government information and telephone numbers. How much does it cost? The best case scenario, if you have an MOT and the car is more than 10 years old, is £55 registration fee plus the cost of the tax disc and insurance. If less than 10 years old and from outside the EU the cost can rise to 4 times as much. Fees have ben highlighted so you can do the sums. 1. Check you have your car’s Chassis number and your Vehicle Identification Number (VIN). The chassis number will likely be on your foreign registration document. The VIN can often be found on the driver’s side of the dashboard viewable through the windscreen. Alternatively open the bonnet and look at the front of the engine, or between the carburetor and the windscreen washer unit. If your car is post 1981 the VIN will have 17 characters. It costs £100 and you will also need to supply a document from a garage to show that the car has lights and speedometer that are suitable for UK use. Call the legislation team on 0300 330 5797 if you need help. 4. You’ll also need an MOT. You may be able to get this done at the same time as the IVA. are legally permitted to drive an untaxed uninsured foreign vehicle to an MOT station appointment. On the way home its pretty much pot luck. 6. Insurance. At this point you will need to find chassis only insurance. Admiral do this but ensure that on the insurance document the chassis number, the make and model appear at the top or at least the chassis number with a covering letter from the company stating the make and model. You can also try Direct Line, Zurich, Adrian Flux and AJ Insurance. Make the call last. Admiral for example allows only 14 days on chassis only. This is likely a hangover from the days when there were DVLA offices which you could visit in person and have the registration in a couple of days. All local offices have now closed and UK registration application can be processed only by post. However if you include a letter explaining the urgency they will do their best. Send in the form as soon as possible after you put the phone down after arranging the insurance with the. The clock is ticking. 7. On receiving your new registration in the post from the DVLA, call your insurance company and tell them the new registration so they can issue up to date documents. 9. Plates. Call your local Halfords (or other registered plate makers) and check they make plates. Take your reg permission doc from the DVLA and the registration document plus your drivers license. Halfords will fit your new registration plates for a fiver and the cost of the plates will depend on the style you choose. 10. Take a photo to remember this day.